This lovely sand dune nature reserve was once joined to Kenfig National Nature Reserve, and a continuous belt of sand and dune systems ran all the way along the coast from the Ogmore estuary as far west as the Gower Peninsula. Although there are interruptions to the sandy beaches these days, we are lucky in Wales to still have some large and relatively unspoilt coastal and sand dune habitats which are home to many fascinating plants, insects and birds. The sand dunes at Merthyr Mawr are very unusual because they have formed against a Carboniferous Limestone Plateau that runs from East to West along the coast, making the dunes at Merthyr Mawr the second highest in Europe. This reserve also contains examples of the successional stages of dune formation, from bare sand, embryonic dunes to (further inland) stabilised dunes and slacks. Good areas of dune woodland and scrub add to the immense range of habitats and resulting wildlife diversity that make Merythr Mawr such a special place. The site is managed by Natural Resources Wales (NRW), and it is designated as a SSSI because of its wealth of plants and insect life. 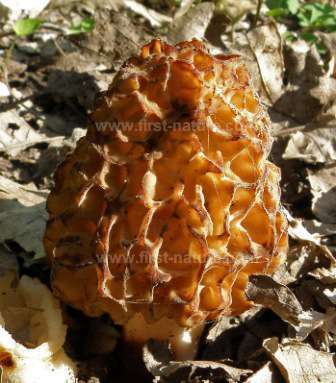 It is also well known as a place where some nationally rare and unusual fungi species grow. For the main entrance to the reserve, leave the M4 motorway at Junction 37 and then follow the A48 towards Bridgend. Turn right towards the village of Merthyr Mawr. Once in the village continue in a westerly direction along Merthyr Mawr Road, passing the village church on your right-hand side, for a distance of around three km (two miles) until you come to the main car park, which has room for approximately 100 cars. There is a network of well-trodden paths throughout Merthyr Mawr NNR but they are steep, uneven and sandy and not suitable for wheelchairusers or for prams and pushchairs. 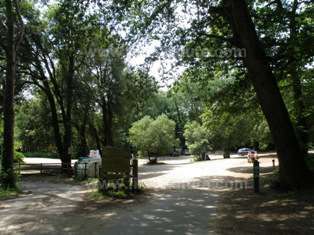 Apart from interpretation boards and a toilet in the car park, there are no facilities at the nature reserve; however, there are shops, pubs and public toilets in the surrounding villages. This nature reserve is truly a plant paradise. Not only is Merthyr Mawr home to all the lovely brightly coloured flowers that you would expect to see in spring and summer in sand dunes, but it is also a refuge for a number of rare and endangered plants, too. If we start from the sandy beach area, there are colonies of Prickly Saltwort (Salsola kali), Sea Sandwort (Honkenya peploides) and Babington's Orache (Atriplex glabriuscula). Further inland the dunes have become stablised with species such as Marram Grass (Ammophila arenaria) and Sand Couch (Elytrigia juncea). Sea Holly (Eryngium maritimum) brightens up this area with its lovely but very prickly, blue-green leaves and blue flowers. The dune slacks (flat areas in between the dunes that become submerged by rainwater during winter) are heavily grazed by rabbits, creating areas of open short sward that are much favoured by briophytes and lichens. Because of the higher levels of moisture found in the dune slacks, they are home to some wild orchid species, too. Marsh Helleborine (Epipactis palustris) is a particular example of this and only grows in the slacks because they are submerged during in winter. Said by many to be our most beautiful wild orchid species, it flowers at the end of June and well into July. Earlier in the year two marsh orchids flower in the dune slacks, Southern Marsh-orchid (Dactylorhiza praetermissa) and the Early Marsh-orchid (Dactylorhiza incarnata) - early June is a good time to see these two species. It is in this area that the rare liverwort, Petalwort (Petalophyllum ralfsii), grows in damp, bare patches of sand in between the creeping willow that is much in evidence in parts of the slacks. This plant is seriously threatened because of loss of habitat, and it is a priority plant of the UK Biodiversity Action Plan. 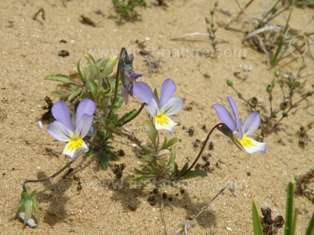 Flowering plants that grow alongside the dune slack orchids include Lady's Bedstraw (Galium verum), Wild Pansy (Viola tricolor) and Wild Thyme (Thymus praecox). 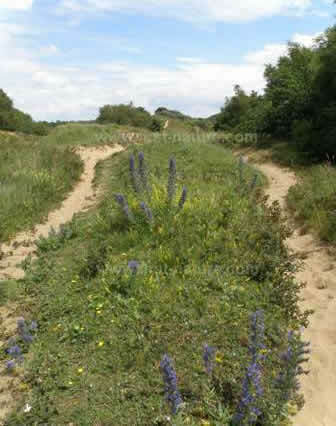 Merthyr Mawr has areas of fixed dunes dominated by rank growth of grasses including Yorkshire Fog (Holcus lanatus) and flowering plants such as Dewberry (Rubus caesius), Burnet Rose (Rosa pimpinellifolia) and the brilliant purplish-blue Vipers Bugloss (Echium vulgare) which contrasts with stands of Rosebay Willowherb (Chamerion angustifolium). Hugging the sand are lovely bright-yellow patches of Biting Stonecrop (Sedum acre). Another important wildflower habitat at Merthyr Mawr is the calcareous grassland found on the south-facing slopes of the limestone plateau. In places the rock protrudes through the grass, and this area is home to Autumn Gentian (Gentianella amarella) and Autumn Lady's-tresses (Spiranthes spiralis). The latter is a wild orchid that blooms towards the end of the summer - late July and the beginning of August; it favours very short, grazed grassland, but despite this and the fact that it often occurs in large numbers, this orchid can be very difficult indeed to spot due to its diminutive size. Hairy Violet (Viola hirta) also grows in this special grassland. There are karstic springs in the reserve, and these create an area of swamp where, along the banks of a small channel created by one of the springs, there is a rare birthwort (Aristolochia clematis). This plant was introduced to the UK from southern Europe and grown around convents where nuns, who provided midwifery services, used it to accelerate births. Whether nor not it was also used by the nuns themselves remains a closely guarded secret! The foul-smelling, yellow, funnel-shaped flowers of the plant were thought to resemble the shape of a uterus - hence, via the Doctrine of Signatures, came about its application. Other plants growing in the swampy parts of Merthyr Mawr include Yellow Flag (Iris pseudacorus), Meadowsweet (Filipendula ulmaria) and Wild Angelica (Angelica sylvestris). The saltmarshes at Merthyr Mawr are also home to a variety of plants that have adapted to live in this hostile (to most plants species) habitat. In the lower saltmarsh area you will find Common Saltmarsh Grass (Puccinellia maritima), Sea Purslane (Atriplex portulacoides) and a species of Glasswort (Spergularia sp.). Higher up there is Sea Arrowgrass (Triglochin maritima) and Rock Sea-lavendar (Limonium procerum). Other rare and endangered plants that can be seen in Merthyr Mawr NNR include Sea Spurge (Euphorbia paralias), Hutchinsia (Hornungia petraea) and Round-leaved Wintergreen (Pyrola rotundifolia). 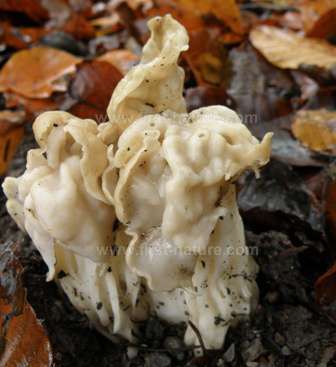 This marvellous nature reserve is also where you can find some rare and unusual macrofungi. Apart from Morels (highly prized edible fungi) and Helvellas (saddle fungi), you may also find Tulostoma melanocyclum, Russula cessans, Suillus fluryi and the beautiful Wrinkled Peach mushroom Rhodotus palmatus. Such a diversity of plant life automatically triggers the interest of those who are interested in invertebrates, and there are a number of scarce and rare species at Merthyr Mawr. The Dune Tiger Beetle (Cicindela maritima), Cuckoo Bee (Coelioxys mandibularis), Solitary Wasp (Psen bicolor) and Mining Bee (Colletes marginatus) are all present, as also is a rare weevil, Glocianus pilosellus. All the way through from the appearance of the early spring flowers and on into the autumn when the fungi of dune habitats really come into their own, there is plenty to enjoy in this fascinating wildlife haven.